most space of their Character's life track. Put a white marker on level 0 of the Morale track on the main board. Put a black marker on the topmost space of the Weapon level track (next to the Weapon icon which represents level 0). Take the 9 Invention cards marked with the symbol beside their names, and another 5 random Invention cards and place them Invention side up in the appropriate spaces on the main board. Shuffle the remaining Invention cards and place them side up near the main board, creating the Invention deck. Separate the Aventure cards by their backs. Shuffle each set and place them face down next to the appropriate Action fields on the main board. Shuffle the Beast cards and place them face down near the main board, creating the Beast deck (note that this deck is not the same as the Hunting deck that is created from Beast cards during the course of game). Shuffle the Mystery cards and place them face down near the main board, creating the Mystery deck. Take the Island tile marked with the number 8 and place it face up (island side) in the indicated Island space on the main board. Place the Camp token (Camp side up) on that tile. Put a black marker on the Shovel card, to cover the required terrain type icon, i.e. beach. This terrain type is explored at the start of the game by placing the first Island tile. Shuffle the remaining Island tiles and place them in a face down stack near the main board. Shuffle the 8 Starting Item cards, draw 2 of them and place them face up next to the main board. These Items are shared by the players. Each Item can be used only twice during the game, and players can use them at any time (unless stated otherwise on the card). Place two black markers on the lower part of each Item card (to cover the boxes icons). The remaining Starting Item cards are returned to the box. Shuffle the Discovery tokens and place them in a face down stack near the main board. 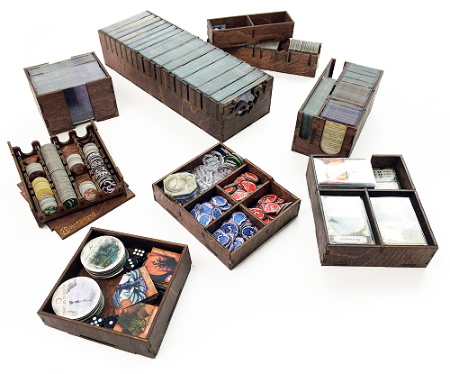 Place all the resource cubes, markers, remaining tokens, additional pawns, and all the dice (Action dice and Weather dice) within easy reach of all players, next to the main board. Place the selected Scenario card near the main board, and put the Round marker on the "Round 1" space on the Scenario card. Separate the Event cards into two face down piles - one that shows a Book icon, and the other that shows an Adventure icon (of any color) - and shuffle each. Then divide the number of rounds depicted on the selected Scenario card by 2 (round up), take that number of cards from each pile, shue them together, and place them face down in the Event space on the main board, creating the Event deck. Any remaining Event cards should be placed back in the box. Place the Wreckage card "Food crates" in the rightmost space of the Threat Action field. 18. The youngest player takes the First Player token. The First Player has two additional duties during the game: he is the player who gets or discards Determination tokens in the Morale phase, he resolves any disagreements between player. When there are 4 players, take the special "Arranging the Camp" card and place it on the board covering the corresponding space. When there are only 2 players, they have an additional Character - Friday. Take the Friday card as well as the white pawn, and place them within easy reach of the players, near the board. Take a Wound marker and put it on the leftmost space of Friday's life track. 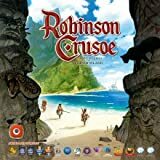 Robinson Crusoe is a cooperative game. The players will either all share the victory (if they all survive and full the Scenario goal), or all lose (if one of the Characters dies, or if they do not full the Scenario goal in the designated number of rounds). Skip this phase in the first round. Starting in the second round (and each round thereafter), draw the top card from the Event deck and immediately resolve it. At the beginning of the game, there are only Event cards in the Event deck. However, during the course of the game, you will shuffle some Adventure and/or Mystery cards into this Event deck. Example: The player draws an Adventure card from the Event deck. There's an Event effect, "Storm", which instructs him to put a Storm token in the Weather space, and then draw another card. The next card is also an Adventure card, and because of its Event effect "Collapse", the players need to decrease the Roof level by half (the loss is rounded down) and draw another card. At last, this next card is an Event card. 1. First, observe whether the card is marked with an Adventure icon ( ) or with a Book icon ( ). 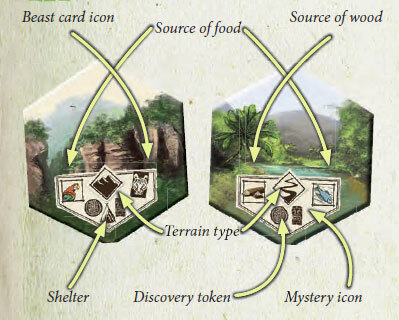 If it shows an Adventure icon, take the appropriate token and put it on the appropriate Action field on the main board. 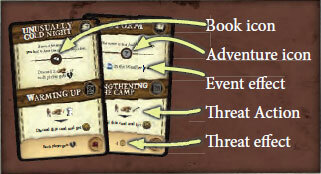 If it shows a Book icon, check its meaning on the Scenario card (the meaning will vary in each Scenario). 2. Resolve the Event effect of the card, and then place the card on the rightmost space of the Threat Action field on the main board. If there is already one card on the righmost space, the previous card is moved to the left so the new card can be placed on the rightmost space, eventually pushing a card on the leftmost space. If, as a result of sliding the Event cards, this pushes the card located on the left off the main board, the Threat effect of that card is now resolved, and then the card is discarded. Check the Morale level that is tracked with the white marker on the Morale track of the main board. gains the depicted number of Determination tokens (at the highest level, the First Player can choose to gain 2 Determination tokens or heal 1 Wound). If the First Player has to discard more Determination tokens then he has, he must discard all that he has and receives 1 Wound for each missing token (according to the general rule of Unfulfilled Demand). Example: If Morale is on the lowest level, the First Player must discard 3 Determination tokens, but he only has 1. He discards it and receives 2 Wounds. source of wood which provides . All of the resources that players receive in the Production phase (or in some rare instances, the Event phase) should be placed in the Available Resources space. These resources are available to use by the players immediately. Example: If the players have their Camp on an Island tile with a source of food and a source of wood, they would receive 1 food and 1 wood during the Production phase. The number of resources that the players receive may be modified by the effects of various Items, Adventures, Events, etc. This is the most important phase of the game and consists of two stages: Planning and Resolving Actions. There are no individual player turns, instead all players decide as a group which Actions they wish to take. Players indicate their choices by assigning their pawns to the various Actions that are available to them. The pawns are used to represent the Characters' activity on the island. As such, with their two pawns, each player can take up to 2 Actions. However, note that many Actions require more than one pawn to be assigned to them in order for the Action to be resolved. (requires one or more pawns) - The number of pawns required for each Threat Action is always depicted on the specic Event card. This Action is taken to prevent the Threat effect of an Event card (located in the Threat Action field) from taking place. Once resolved, this Action provides the players with a benefit which is described on the card (often as Determination tokens or resources). (available only if there is a Hunting deck of at least one Beast card - always requires 2 pawns to be resolved). Hunting allows a player to get a food and/or furs but it usually results in that player also receiving Wounds. (Can be taken with either 1 or 2 pawns, see below for further details). Building allows players to build a Shelter, a Roof, a Palisade or Weapons, and turn Inventions into Items. Gathering Resources allows players to gain resources from certain explored Island tiles (wood or food). 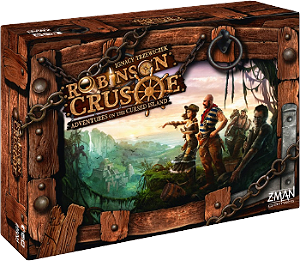 Exploration allows players to explore the Island by placing subsequent Island tiles on the main board. (Requires 1 pawn). 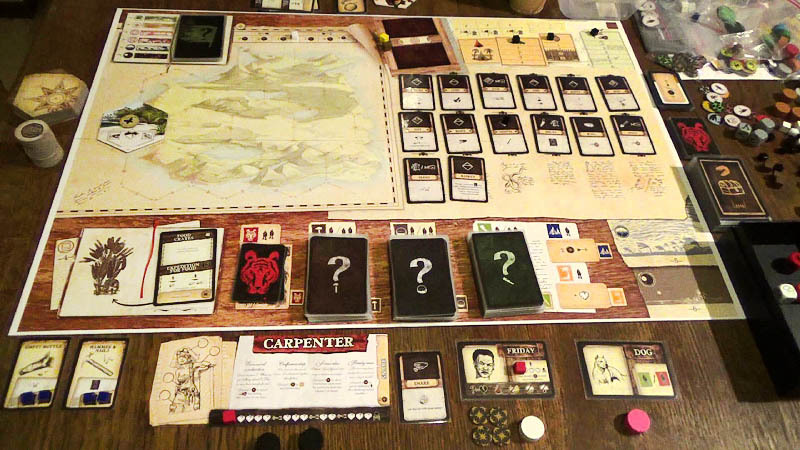 Each time a player takes this Action, he receives 2 Determination tokens and increases the Morale level by 1 on the main board (in a 4-player game, each time a player takes the Arranging the Camp Action, he either receives 2 Determination tokens or increases the Morale level by 1 on the main board). Each time a player takes this Action, he heals 1 Wound. Note: Each Action can be taken multiple times in the same round, except for the Threat Action, which is always a onetime Action taken on a specific card, after which the card is discarded. There can be a maximum of 2 Threat Actions to take because there are 2 Threat Action fields on the main board. Each Threat action must target a different Event card. Several Actions, including Building, Gathering Resources, and Exploration, can be taken with 1 or 2 pawns. If only 1 pawn is assigned, then, while resolving the Action, you will have to roll all 3 Action dice of the respective color to see if the Action is successful, if you get wounded, and if you have an Adventure. If 2 pawns are assigned, the Action is guaranteed to be successful, and you will not need to roll any dice. Note: The second pawn can be a player's pawn, or an additional pawn. for the threat Action, place pawn(s) on the respective Event card(_). for Hunting, place pawns on the Hunting Action field. for Building, depending on the element you wish to build, place pawn(s) on the Shelter, Roof, Palisade or Weapons track, on the selected Invention card, etc. for Gathering Resources, place the pawn(s) above the one specific source on the Island tile(_) from which you are gathering resources (only above one source, even if the Island tile shows two sources). for Exploration, place the pawn(s) on the unexplored space(_) of the island you want to explore. for Arranging the Camp, place the pawn(s) on the Arranging the Camp Action field. for Rest, place the pawn(s) on the Rest Action field. When an Action is taken with more than 1 pawn, those pawns can come from more than one player, or they may come from additional pawns gained during the game. If they come from multiple players, those players should decide which player is going to take the Action, and who is only supporting (his pawn is treated like an additional pawn, as described below). This is important because the effects of certain Actions (and Adventure cards resolved during Actions) affect only the player taking the Action and not the whole group (i.e. Hunting). Each round, during the Event phase, a new Event card will be placed in the Threat Action Field after it is resolved. Each of these cards (except Wreckage cards - see below) will have a specific Threat effect and Threat Action described on it. If a previously placed Event card is moved off the board after placing a new Event card in the Threat Action Field, the removed card's Threat effect will need to be resolved. In order to prevent this from happening, during the Action phase players can plan to resolve the specific Threat Action described on the card by assigning the required number of pawns (1 or 2) and meeting any additional requirements (for example: discard food or wood, have a certain Weapon level, etc).. If players meet these requirements during the resolve Action phase, they receive the benefits described on the card (usually Determination tokens), and then discard the card thereby preventing the Threat effect from occurring later in the game. Although each Threat Action can only be taken once per card (since the card is discarded after it is resolved), up to two Threat Actions can be taken during a round if two such cards are located in the Threat Action Field. Wreckage cards (which appear in the first round only) that are located in the Threat Action Field provide a choice of assigning either 1 pawn and getting fewer resources (as shown on the card) or assigning 2 pawns and getting more resources (also shown on the card). Players can choose only one of the possible options when taking this Action, after which they discard the card. With each Building Action, players can build a Shelter, a Roof, a Palisade, or Weapons, or turn an Invention into an Item. Shelter - Protects you from getting Wounds for sleeping in the open air during the Night phase. Once built, the Shelter cannot be lost for the remainder of the game. To indicate this, place a black marker on the applicable space on the main board. Note that certain Island tiles also contain a Shelter which is different from a player-built Shelter. Roof - Protects you from the weather conditions during the Weather phase. To build a Roof, there must be a Shelter (either built or discovered) on the Island tile where your Camp is located. Each time you build a Roof, increase its level by 1 by adjusting the respective marker on the board. ffect and some other effects during the game. To build a Palisade, there must be a Shelter (either built or discovered) on the Island tile where your Camp is located. Each time you build a Palisade, increase its level by 1 by adjusting the respective marker on the main board. Weapons - are required for Hunting. The higher the Weapon level, the less likely it is that a player will receive Wounds while Fighting a Beast. Each time you build a Weapon, increase its level by 1 by adjusting the respective marker on the main board. Items - Building certain Items generally provides some additional benets (either immediately or during the course of the game) which can be helpful to the players (for example, the Map provides players with an additional pawn for Exploration). The Shelter, Roof and Palisade all have the same cost depending on the number of players, as depicted in the applicable table on the main board. You can pay the build cost in either wood or furs, but not with a mix of both. For example, in a 3-player game, you need to discard either 3 wood or 2 furs to build the Shelter, but you could not pay 2 wood and 1 fur. Each time you build Weapons, you need to discard 1 wood. When built, Items usually provide some additional benefits which can help you during the game. Examples: Fire increases the Palisade level by 1 and lets you build the Fireplace. Knife increases the Weapon level by 1 and lets you build the Bow. Map gives players an additional pawn for Exploration and is required to build the Shortcut. on the selected Scenario card (available to everyone). Note: Each Item may only be built once (unless lost). Several Actions (mostly Threat Actions and Building) have additional requirements for taking the Action (e.g. discarding a resource, having a specific Item, or a minimumWeapon level, etc). While resolving Actions, players can only use resources which they already had when they planned the Actions (i.e. those resources that are in the Available Resources space). They cannot use any resources gained in the same Action phase (although Actions are resolved in a certain order, you should always imagine that they are all done simultaneous), so when planning Actions, you should not only assign pawns to certain Actions, but it is also recommended to assign the required resources from the Available Resources space to avoid any confusion. Example: In a 3-player game, you need to spend 3 wood (or 2 furs) to build a Shelter. Thus, while planning for this Action, you should already have the 3 wood (or 2 furs) and assign them along with the pawn(s) to Building Shelter. The same rule applies to Items - you can only use items during this phase which you already had while planning the Actions. The same rule applies to the Weapon level. Some Threat Actions require having a minimum Weapon level to take these Actions - you cannot take such an Action if you do not have the required minimum Weapon level at the time you are planning the Actions. Gathering Resources can only be performed on Island tiles that are either a adjacent to the Island tile where the players' Camp is located, or b one tile away from the Island tile where the players' Camp is located (see below). 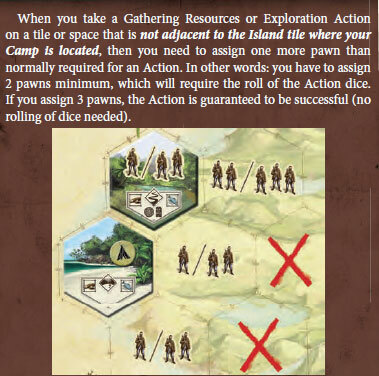 This Action cannot be taken directly on the Island tile with the players' Camp since players get resources from that tile during the Production phase. From each source that is on an Island tile, you can gather only 1 respective resource (it can be modified by the effects of some Items, Adventures, Events, etc)..
You can gather only once per round from each source; i.e. if one player assigns his pawn(s) to gather from one source, no other player can gather from that same source this round. Exploration can only be performed on unexplored spaces that are either a adjacent to the Island tile where the players' Camp is located or b one explored tile away from the Island tile where the players' Camp is located (there can be at most one Island tile between the space players want to explore and the tile where their Camp is located, see below). Each player's pawn that is assigned to the Arranging the Camp or Rest Actions is resolved separately. For example, in a three-player game, if one player assigns both of his pawns to Arranging the Camp, he resolves this Action twice, and as a result, he receives 4 Determination tokens and increases Morale by 2 levels. Discard the required resources depicted on the card (if any) and follow the instruction on the card. Then discard the card and gain any resources or Determination tokens shown. If a player gains any resources from a Threat Action, he should place them in the Future Resources space (they will only be available after all Actions have been resolved). If a player gains any Determination tokens, he places them in his own supply, and they can be used immediately. Draw top card from the Hunting deck and Fight the Beast depicted on the card as described below. 1. Compare the Beast's strength to the player's current Weapon level. If the Weapon level is lower than the Beast's strength, the player figthing the Beast gets 1 Wound for each missing Weapon level. 2. Decrease Weapon level by the number shown on the card. 3. Gain the number of food shown on the card and place them in the Future Resources space (it will only be available after all Actions have been resolved). 4. Gain the number of fur shown and place them in the Future Resources space (they will only be available after all Actions have been resolved). 5. Decrease the Palisade level by the number shown (this effect appears only on a few Adventure cards). 6. Apply any other additional effects and discard the card. Some cards (Adventures, Events, Mysteries) require you to Fight a Beast but only show the Beast's strength. In such cases, you should only compare the Beast's strength to the current Weapon level; if the Weapon level is lower than the Beast's strength, the player who is Fighting a Beast gets 1 Wound for each missing Weapon level. When you build a Shelter, discard the required resources, turn the Camp token Shelter side up. The Island tile where you build the Shelter becomes your Camp tile. Once you have built the Shelter, you cannot lose it, and as such you do not have to build it again. To indicate that you have built a Shelter, place a black marker on the Shelter space, as well as additional black markers on the topmost spaces of the Roof level track and the Palisade level track on the main board (next to the appropriate icon; this can be treated as level 0). To build a Roof or a Palisade, you must have already built a Shelter, or your Camp must be located on an Island tile with a Shelter (see Exploration, below). Each time you build a Roof, a Palisade or Weapons, discard the required resources and increase the respective level by adjusting the appropriate marker(s) on the main board. Roof, Palisade and Weapon levels are not limited. When you build an Item from an Invention card, discard the required resources and place the Invention card in the Future Resources space (it will only be available after all Actions have been resolved). If a player builds the Item from the Invention card located on his Character's card, he also gets 2 Determination tokens, which he puts in his own supply, and places the Invention card in the Future Resources space (it will only be available after all Actions have been resolved). At the end of the Action phase, take the Item cards from the Future Resources space, apply any additional effects, and finally place the cards in the appropriate spaces on the board, Item side up. If a player builds an Item from the Scenario card, he marks it with a black marker (except where noted otherwise). The players should remember to apply the additional effect of this Item at the end of Action phase since that Invention is only depicted on the Scenario card, and it cannot be moved to the main board. When you gather resources - take the appropriate resources from the supply near the main board, and put them in the Future Resources space (they will only be available after all Actions have been resolved). You can only gather 1 resource from each respective source on an Island tile, but this can be modied by the effects of some Items, Adventures, Events, etc. If the exploration action was successful, draw the top Island tile from the face down stack and place it face up in the Island space you selected to explore during the planning phase. Look at the terrain type, and mark with a black marker all the Invention cards with this terrain type in their requirements field. If a Beast card icon is shown, shuffle one Beast card into the Hunting deck. If a Mystery icon is shown, check its meaning on the Scenario card. Draw the indicated number of Discovery tokens. Place them in the Future Resources space face up (they will only be available after all Actions have been resolved). Some Island tiles provide a Shelter (Tent icon). However, this does not mean you now have a player-built Shelter; as such, do not mark the applicable spot on the main board (nor turn the Camp token upside down to the Shelter side) unless you have built a Shelter using the Build Action. Having a Shelter is important during the Night phase. Example: The player draws an Island tile and places it on the selected space of the Island. 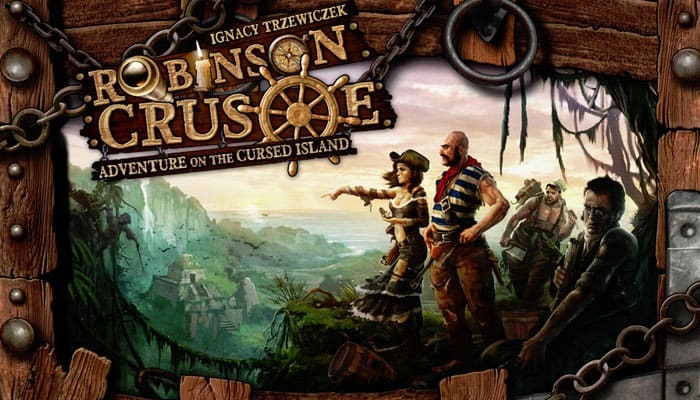 The terrain type of the tile is Plains, which is the first tile of this terrain type to be discovered this game, so the player marks the Invention cards "Basket", "Cure", and "Rope" (these Inventions can now be built into Items). A beast card icon is shown on the tile, so the player shuffles one Beast card into the Hunting deck. Finally, he draws 2 Discovery tokens (as depicted on the tile), and puts them face-up in the Future Resources space. Once every Action has been resolved, you can keep Discovery tokens for later use. You will see that food spoils during the Night phase (for more details see: 6. Night phase), so any tokens representing food will be lost at that time. Discovery tokens are discarded after use. The player taking this Action gains 2 Determination tokens and places them in his own supply. He also increases the Morale level by 1 on the main board (this Action differs in 4-player games, look at the Adjusting the game chapter). If the Morale level is at the highest level, the player only gains Determination tokens and does not adjust the Morale level. The Resting player's Character heals 1 Wound by moving his Wound marker one space to the left on his Character's life track. take all the Invention cards laying in the Future Resources space, apply any additional effects, and place those cards in the appropriate spaces on the board, Item side up. During this phase, players have to face the harsh weather conditions of the island. In order to know the weather conditions, they must roll Weather dice. Look at the Scenario card to check which Weather dice you should roll in the current round. The number of dice to roll varies during the game and depends on the Scenario and round number. There are 3 different Weather dice: Rain die , Winter die , Hungry Animals die . Additionally, always check the Weather space on the main board to see if there are any tokens located there that modify the results (these can occur after an Eventor Adventure card). Those tokens should be added to the outcome of the Weather dice roll. After applying the effect of any tokens in the Weather space, discard those tokens. If you do not roll any Weather dice, only the weather depicted on the tokens (if any) applies. First, add up the total number of Winter Clouds (on dice and/or tokens) you must face, and discard 1 wood for each Winter Cloud, regardless of the current Roof level (this represents the fact that it was a cold night and you had to use more wood to heat the camp). Then, compare the total number of all Clouds (both Rain and Winter Clouds from dice and/or tokens) to the current Roof level. The Roof level indicates the number of Clouds you are protected from. If there are more Clouds than your current Roof level, discard 1 food and 1 wood for each Cloud that you are not protected from (you had to use it to stay warm and healthy during the bad weather). For every resource that cannot be discarded, each player receives 1 wound (according to general rule of Unfulfilled Demand). decrease the curent palisade level by 1.
fight a beast that has a strength of 3. If you cannot resolve the effect of a roll, each player getsa certain number of Wounds. For example: if you have to decrease the Palisade level, but it is already on 0, then everyone gets 1 Wound. If you must roll the Hungry Animals die because of an Event or Adventure card and the Scenario card also indicates that you have to roll the same die, just roll it once. Resolve the Storm after any other effects. The Storm decreases the Palisade level by 1. If you cannot reduce it, each player gets 1 wound. Reminder: At the end of the Weather phase, discard all tokens that are located in the Weather space. During the Night phase, every player needs to eat. Discard 1 food per player. If you do not have enough food for everyone, then decide which player(s) do not get to eat - each player that does not eat gets 2Wounds. During the Night phase, players can decide if they want their Camp to stay on the Island tile it currently occupies or move it to an adjacent tile. Remember that the the Camp's location will impact the next round's Production phase and which tiles/spaces will be adjacent for the purpose of Gathering Resources and Exploration. If the players have built a Shelter and want to move their Camp to an adjacent Island tile, they must decrease by half both their Roof and Palisade levels (the amount lost is rounded down). For example, the players have a level 2 Roof and a level 1 Palisade. If they move their Camp with Shelter to an adjacent Island tile, then they have to decrease the Roof level by 1, but the Palisade level stays the same since half of 1 rounded down equals 0. Except as set forth below, if players have not built a Shelter yet, they can move their Camp without any consequences. If they move it to an Island tile with a Shelter, it does not mean that they have built a Shelter: i.e. do not turn the Camp token Shelter side up. If players have not built a Shelter yet, but they built a Roof and/or a Palisade (if the Island tile had a Shelter), then they lose both the Roof and the Palisade if they move their camp to another tile (decrease both levels to 0). When you move the Camp, discard the Shortcut token from the Island tile it was on and turn the Shortcut card back to its Invention side. If you want to use it again in a future round, it will have to be built again. If the players have not built a Shelter (and their Camp is not located on an Island tile with a Shelter), each player gets 1 wound for sleeping in the open air. Unless you have nonperishable food or the "Cellar" Item or a Treasure that allows you to store food ("Boxes" or "Barrel"), all remaining food in the Available Resources space rots, and you must discard it. Other resources stay in the Available Resources space for the next round. Remove the black markers from each Character card. (since they indicate which Character skills were used in the current round). Move the round marker on the Scenario Card to the next round and give the First Player token to the next player in clockwise order. You are ready to start the next round. If players have an opportunity to Heal (because of any tokens or card effects), they can only do it during the Night phase (except for the Rest Action and the Cook's special skill). For example, if players have the Treasure card "Bottle of wine" or a token, they can only use it during the Night phase (but at any time during that phase). Players lose when the last round ends and they have not fulfilled the Scenario goal.